The problem: Healthy and fit without sports? Children usually take over eating habits and attitudes towards fitness and sports from their parents. But as they grow older, they have the chance to change these attitudes. They can reject traditions and develop a lifestyle which is different from that of the previous generation. 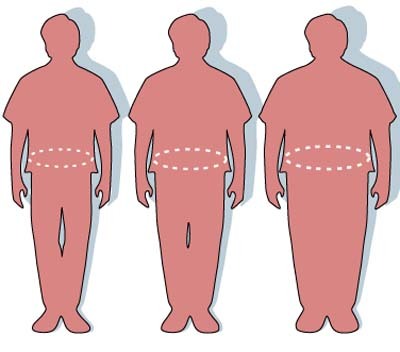 Source: http://commons.wikimedia.org/wiki/File:Obesity-waist_circumference.PNG. Copyright: see that page. "A study of the German College of Sports in Cologne shows that men and women in the age range between 16 and 25 have a passive and unhealthy lifestyle, which is not only bad for their health; it can also lead to problems in their working life. The study, with almost 13,000 participants, consisted of an anonymised written interview, body measurements, and physical achievement tests. Strength, speed, patience and coordination were tested. The results are that 50 % of the 25-year-old men involved in the study are overweight, 60% smoke and about one third live with the motto, 'no sports'. Academically gifted students are much slimmer than pupils who leave school after the compulsory 10 years. The sport scientist Max Wunderlich explained that only every fifth 25-year-old person is active in a sports club and that around 60% of the women of this age group smoke. If you summarize the results of the study, you find that around 75 % of those between 16 and 25 years are in danger because of physical inactivity and too much weight as they do too little sports. It will not only cost the German health system billions, there will also be problems on the labour market." Source: http://commons.wikimedia.org/wiki/File:Cyclo_touring_illustrative.jpg. Copyright: see that page. "I am here today to tell you something about sport, and I would like to show you how many positive aspects sport can bring into our lives. Let's start with an element which is essential in practicing every sport – the human body. It's built with two co-operating systems. The first one is a bone system, responsible for a proper figure and also a protection (ribs). Practicing a sport has a good influence on a correct and symmetric bone system development. It is directly connected with the muscle system, which is responsible for every single movement. Physical activity keeps the human body fit and healthy and has a positive influence on the working of the heart and the brain. Sport has a significant meaning for the development of your organism. For example, swimming is very good for a child because it helps a lot to grow up healthily. It significantly decreases the chances of spine defects in future life. Another thing is that children who are physically active in their childhood as well as in later life do not suffer from obesity, which is common in our fast-food society. Sport has a lot of other advantages, not only for health but also for social life. No matter at what age you start to train, you can always meet new people, start new friendships or just spend your free time. In every discipline of sport you are able to strengthen your character and learn new abilities. Sport is mainly based on rivalry and competition. While practicing sport it is extremely important to set yourself certain goals and then do everything to achieve them. This ability is equally good at work or at school. So, having learnt it by doing sport, it can be used in your whole life. By practicing sport you can work on your self-confidence when playing other teams or opponents. You can enjoy victory, which is supposed to be a nice feeling. You can also be defeated, but it still teaches you how to cope with failures. What's more, you can learn the rules of teamwork as well. As a result of regular training you can see how your body changes. You will get fit and strong. Everybody will see that you care about how you look. These are the external effects, but you also strengthen your organism from inside. Your heart is working better, you have healthier lungs and you don't get sick easily. If you're not interested in regular training you can do sport in your spare time just as a hobby. It gives you the opportunity to meet with your friends to play Frisbee or go walking with your family and dog by the lake during the weekend. There are so many different types and disciplines of sport that everyone can find something which suits him or her best, and the favorite discipline can become a life-long hobby."